History of Samnium and Samnites - The territory and their settlements. The center of hinterland of southern Italy was the territory historically recognized for the presence of the Samnites' occupation. At that time this territory was delimited to the north by the Sangro river, the Marsi and Peligni's regions, to the south by the Ofanto river and Lucani's lands. 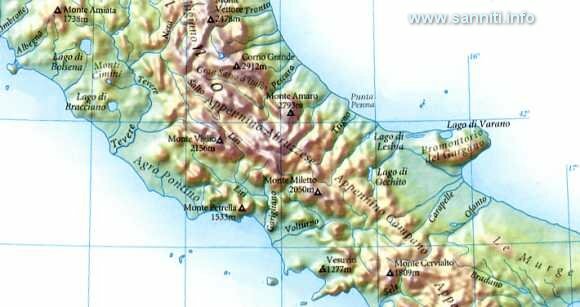 To the east by the Apulian's flat lowlands and Frentani's region and to the west by the Campania's lowland and lands belonging to the Aurunci's, Sidicini's and Latin tribes. These possessions, infact, were made up by morphological differences with limestone mountains that, even though not impassable, certainly caused some indrance to people and their goods to safely transit. Ancient Italics at IV century b.C. And just because of this particular morphological situation making this samnites' territory difficult to snare, it allowed these inhabitants to control a big portion of the southern peninsula. The limited flatlands, circumscribed by the Samnium' inaccessible mountain's slopes, supported in olden days the installation of populations due to the Holy Springtime. This being a prophetic cult of italic people based upon their forced migration. The shepherd-warriors of many mediterranean etnicities were most likely responsible for these forced migrations. Samnia at the Volturno's springs. Moreover these natural roads would go thru and unite, in a contigous morphological way, these rivers' large valleys where, on the mountains delimiting their expanse, many important strongholds of Samnites were built. Actually the tratturo or sheep-track Pescasseroli-Candela goes right through the heart of the Samnium explaining why the sacred role of such an iter became integrant part of this people's life. Such a sheep-tract from the Pelignis through a vast part of the central Appennini's mountains was going to Aufidena, to continue toward Aesernia, Bovianum, Saepinum and finally to Maleventum (Benevento) and Venusia. Obviously it is admissable that this really represented the main fulchrum of the territory's socio-economic development. Together with the Pescasseroli-Candela tratturo, many secondary ways completed the communication network like the one of Castel di Sangro-Lucera, uniting the lands around the Sangro river with those of the Fortore's, while the tratturo Celano-Foggia connected the area of Chieti with the Apulian highland. Minor spurs went through the closeby lands of Samnium touching in the east the Frentani's and the Messapi's in the south. In the north even smaller spurs were feeding nearby areas, departing from the more important tracts to cross or unite particularly fertile pastures. For instance the "tratturo of Forme" from the Mainarde mountains would go eventually to the springs of Volturno rivers. Another ramification from the opposite site, would go from the Pescasseroli-Candela area around the Vandra river to the fruitful plains of Campania. Both these two small networks, following the highlands of the Volturno's river, as defined around the IV century b.C., constituted a matrix of the road uniting the plains of Capua with those of the Sangro's river. The real utilization of these roads established the course of an actual economic development. Easy to say that the ancient Samnites made most of their business out of the breeding of lifestock and selling their by-products such as wool, leather and cheeses and having a great market presence among the Campani's as well the Iapigi's people. These products indeed proved to be essential for the swap of merchandise not locally available and that had to be imported.